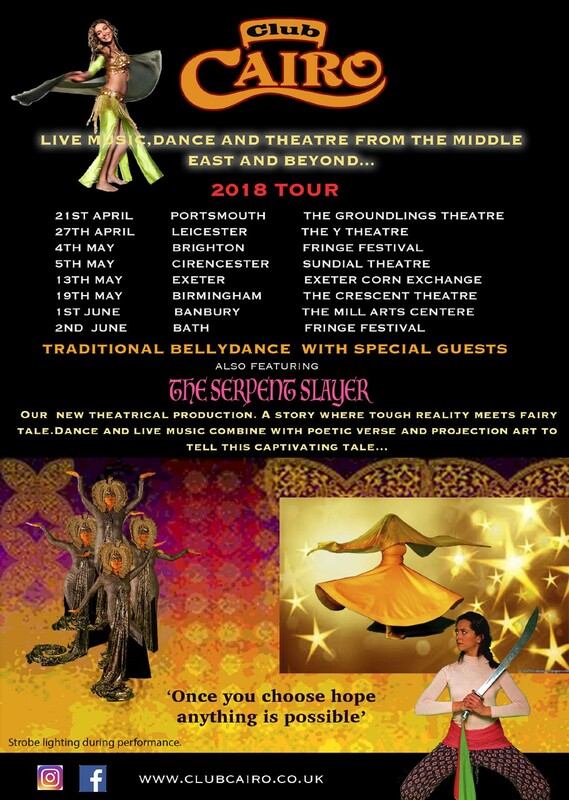 Audiences are being treated to a sensational dance performance from Club Cairo as the group's "The Serpent Slayer" tours the country. The show promises spectators a true spectacle, in which they will be transported to exotic lands. Since 2010, Club Cairo has been performing their own unique celebration of music and dance from across the Middle East and beyond. They specialise in shows which offer a sense of wonder, gathering rave reviews and sell out shows. The 2018 tour is entitled "The Serpent Slayer" - a touching story of two sisters on a magical quest, showing how hope can shine through the darkest skies. The story combines the harsh realities of modern day life in the Middle East with the magic and fantasy of an Arabian fairy tale. The cast of dancers and musicians combine with poetic verse and multi-media projections to tell this tale. As with all of Club Cairo's shows, it offers a truly multicultural gathering, drawing together a feast of global delights. The shows are unique and greatly enhanced by an incredible live soundtrack and amazing visual projections. The interaction between musicians and dancers is an integral part of the performance and offers a new experience to the audience. The show is split into two halves, with the second half involving local dancers who come and join the performance. The dancers will be performing to a live and light hearted set of traditional songs accompanied by Club Cairo's musical ensemble. A chance to see a dazzling display of belly dance performances. There are eight dates in total for the UK tour, beginning in April 2018. Please see the Calendar page for details of other upcoming performances.